The idea that public school teachers need to go on strike in order to get livable wages and benefits is spreading, much to the dread of the billionaires who control both major political parties. 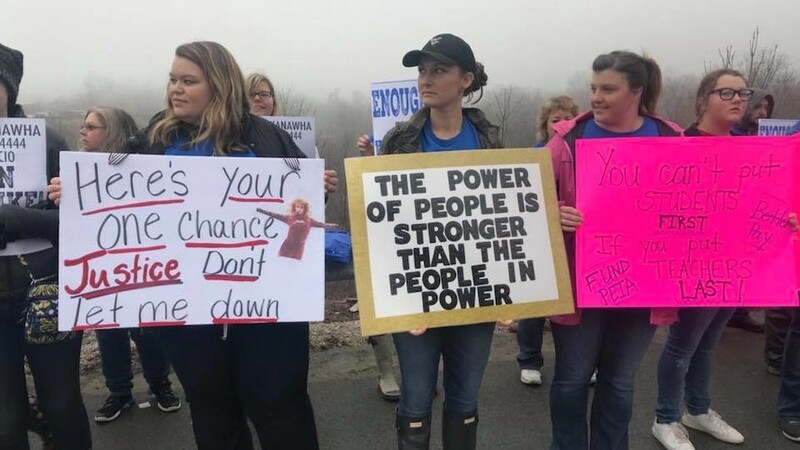 Early in March 2018, striking West Virginia teachers declared victory with a 5 percent raise and returned to their classrooms. Their organizing and their 13-day strike not only forced the legislature to raise their rock-bottom pay; it backed off corporate-linked education “reformers” on a host of other issues: charter schools, an anti-seniority bill, and preventing payroll deduction of union dues, and the rich who control the corporations that would benefit from these things are not happy state money went to impoverished public school teachers. Emboldened by the success of the teachers of West Virginia, teachers in Oklahoma, Arizona, and Kentucky are now striking, sicking out, rallying, and Facebooking to push officials to raise their salaries and defend their benefits. Teachers in Oklahoma are set to strike on April 2 if the legislature doesn’t grant a $10,000 raise for teachers and a $5,000 raise for school support staff. It’s been a decade since Oklahoma teachers got their last raise. According to the Bureau of Labor Statistics, pay for educators there ranks last in the country, with high school teachers averaging $42,460. Arizona teachers signed up in droves for a new Facebook group, “Arizona Educators United.” Thirty thousand joined in its first 10 days. Teachers there are building a grassroots “Red for Ed” movement, spreading photos of themselves wearing red T-shirts to school every Wednesday and assembling en masse at legislative hearings at the Capitol. The latest state to join the strike talk is Kentucky, where the fight is about pensions and funding cuts to schools. Having systematically underfunded pensions for over a decade, the legislature is now pushing to cut cost-of-living adjustments for teachers and other employees. Like teachers in 14 other states, Kentucky teachers do not collect Social Security, so they rely entirely on the state pension system. These four states; Kentucky, Oklahoma, Arizona, and West Virginia are dominated by the Republican Party, which is controlled by billionaires. Strong labor unions can often help defeat the billionaires in state and local elections. Keeping the memberships in poverty and financially starving public education has been a political strategy, effectively waging war against children, the poor and the middle class. On the other hands, the billionaires of the Democratic and Republican parties have to a large degree gutted the tax base of the United States by voting to export tens of millions of US jobs over the last twenty-five years in order to redistribute the massive difference between the old higher wages and benefits of tens of millions of US workers and the new poverty third world wages of the exported jobs. Democrat politicians such as Bill Clinton, Hillary Clinton, Barack Obama, Ron Wyden and Earl Blumenauer have joined hands with Republicans such as George W. Bush, George H.W. Bush, Orrin Hatch, Mitch McConnell, Paul Ryan and John Boehner to export those jobs, and creating the highest income and wealth inequality in US history. On the state and local levels, the rich control contracting corporations that feed on useless public projects and services. Giving the teachers raises and higher benefits means that some public money will need to be diverted from those tax guzzling projects to the teachers, which may negatively impact the share prices of corporations. Hillary Clinton’s new book, What Happened shows she is completely out of touch with reality and voter’s anxieties over the economic policies that have redistributed trillions of dollars from the 99 to the 1 percent. These policies were championed by her, former President Bill Clinton, former President Barack Obama, former President George W. Bush, and a host of other Republicans and Democrats, such as Mitch McConnell, John Boehner, and Wall Street’s favorite brown-noser, Wall Street Senator Ron Wyden. In her book, Clinton blames Bernie Sanders for her defeat in the presidential election. She claims Sanders candidacy split the progressive vote. Hogwash! Hillary lost the presidential election because she is a gold plated pawn of Wall Street. Voters were tired of their jobs and tax dollars being exported to Mexico, China, and Vietnam. Clinton supported the policies that did this. Wall Street loved her support for these policies. The CEOs of Wall Street, other major corporations, and billionaire investors rewarded her and her husband with $150 million in speaking fees from 2001 to 2016, at $225,000 a pop. Progressive voters knew that yes big money had gotten her to change her mind on legislation cutting back on the abilities of working folks to declare bankruptcy on behalf of the big banks who had purchased her lock, stock and barrel (See video above). Progressives knew the mind boggling millions of jobs that would have been exported from the United States to China with the Trans Pacific Partnership, which she called the “gold plated standard” for trade agreements. Then, of course, there was her support as Secretary of State for the coup that overthrew the lawful government of Honduras and resulted in the death of hundreds. You could go on and on about why progressives could not and would not support Candidate Clinton, but you cannot blame Bernie Sanders. Hillary is completely out of touch with reality, but the book suggests she might want to run for president again. Watch the video above. In it US Senator Bernie Sanders strikes back at the ignorant and incompetent Federal Reserve Chairman Alan Greenspan. Greenspan was called “the wizard” because he advocated policies that redistributed income from the 99 to the 1 percent, such as tax cuts for the rich, jobs destroying trade treaties that redistributed income from working folks to the rich, privatization scams, and a ton more. Greenspan was wrong on all accounts, which he admits at the end of the video above. Bernie Sanders was one of the few, and maybe the only, senator who dared challenge Greenspan and his beliefs. Listening to Sanders makes one realize why he should be president of the United States. He would represent all the people, not just the rich folks, like Obama, Wyden, Blumenauer, Boehner, McConnell, Orrin Hatch and so many others do today. This morning, Wall Street Congressman John Boehner introduced Fast Track Authority into the US House of Representatives, which passed 218-208. 190 Republicans and 28 Democrats voted for this scam; 50 Republicans and 158 Democrats voted against it. Eight members did not vote. Now the measure will return to the US senate as a stand alone piece of legislation, where Wall Street Senator Ron Wyden is chomping at the bit to vote for it on behalf of Wall Street billionaires, and against the interests and wishes of the vast majority of Oregonians, which he was elected to represent. Fast Track Authority will allow for the passage of the Trans-Pacific Partnership, the largest income and political power redistribution scam in world history. Previously, Fast Track had to pass with the Trade Adjustment Assistance Act (TAA), which was geared to help the hundreds of thousands of workers, and perhaps millions, whose jobs will be exported with TPP. * give incentives for US corporations to export millions of US jobs. The Federal Reserve estimates that 28 million US jobs were exported between 1990 and 2010. Wyden wants to increase this number. Jobs are the biggest US export product. Wyden likes this. * will increase US income and wealth inequality. The 1 percent have already taken 95 percent of all income growth in the United States since 2009. Currently, the 1 percent are stealing 36+ percent of all income produced in the USA, compared to only 8 percent in 1980. International trade scams and other federal legislation have brought inequality about. For example, when the above jobs were exported, the difference between the old higher US wages and the new lower wages will go straight into the pockets of the 1 percent via higher corporate profits, rising dividends and surging share prices. Wyden is a principle architect of this inequality. * Those lost jobs will no longer be paying the taxes for our infrastructure, K-12 education, higher education (tuition and fees will go up), social safety nets, schools, fire, police, public transportation, social security taxes, but those lost jobs will push the stock markets higher. * will effectively eliminate your voting rights on local and state issues since it will unconstitutionally grant investors of the 0.01 percent special privileges to challenge labeling and health and safety local laws and regulations of the 99 percent, which most people call voter suppression, but in this case it should be called voter elimination. * will eliminate millions of jobs in Latin America, which will drive millions of more people illegally into the United States and depress wages here. See how-the-trans-pacific-partnership-will-destroy-american-jobs-by-destroying-us-exports–Johnhively.wordpress.com . * will raise pharmaceutical prices by extending patents forcing the 99 percent to pay more for big pharma’s products. * will override Wall Street regulations, as if the mostly ineffective US regulations inhibit Wall Street profits and illegal activities. * will increase the US trade deficit. The largest fourteen trade deficits in world history have been the last fourteen US trade deficits. It’s either absolute insanity or absolutely corrupt to desire increasing the trade deficit. Yet, Wyden and other Wall Street Democrats have saliva running down their jowls thinking about voting for Fast Track and the TPP. Think corruption, not insanity. Stunningly, Democrats such as Wall Street Senator Ron Wyden support doing all of the above to the American people. And these things are only a few things we know about. Why are these negotiations so secret? US Senator Elizabeth Warren says it best below. As for Fast Track Authority, if passed by congress, it will mean there be limited debate in congress when the TPP comes up for a vote. 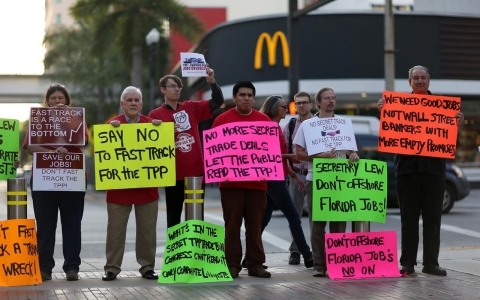 Fast track will also prohibit any amendments to the TPP and eliminate any means to filibuster it in the senate. In other words, fast track rigs the political and economic game against the 99 percent and for the 1 percent. Save your democracy. Stop the corporate takeover of your nation. Call your senators and tell them to vote against Fast Track Authority. Click on the following link to find the phone number and email addresses of your senators; Contact your senators . Congratulations on yesterday’s impressive victory! In case you missed it, the House voted to block Fast Track from moving forward — a huge win for Main Street over Wall Street, and a testament to your years of strategic organizing. Thank you! Unfortunately, the offshorers, the polluters, the lobbyists and the profiteers haven’t given up quite yet, so we’ve got more work to do — and we need to get to back to work fast. Here’s how Friday’s win went down: the House separated the Fast Track bill passed by the Senate into two parts. First was a vote on an inadequately-funded and exclusionary Trade Adjustment Assistance (TAA) program for displaced workers. Then was a vote on the Fast Track process itself. Both parts needed to pass for the bill to pass. You can see how Reps voted on TAA here and how they voted on the Fast Track process here. Bottom line: when TAA was voted down, the entire Fast Track bill was sunk. After the vote, Speaker Boehner called for a re-vote on TAA. That vote is supposed to happen within two legislative days, so it’ll either be on Monday or Tuesday (although the Speaker may be able to find ways to extend that if he wants). Voting on Monday starts at noon Eastern, so that’s the earliest the re-vote could occur. Unfortunately, there is still some confusion about the proposed TAA program even among our allies, and you’d better believe the White House, Republican leadership and others are working overtime this weekend to increase that confusion. Here’s what you need to know about TAA. Normally, we’re all for it. It’s an important lifeline that provides job retraining benefits to people whose careers are shipped abroad as a result of bad U.S. trade policy. But nobody in their right mind would ever argue that a job retraining program is a smart trade-off for rubber-stamping massive trade agreements like the Trans-Pacific Partnership (TPP) that will offshore jobs, drive down wages and more. That’s what a vote for TAA next week is. It’s a vote for Fast Tracking the TPP. The current TAA proposal is a cynical ploy that needs to be stopped. As if that weren’t bad enough, the TAA program being offered isn’t even a strong one. It excludes public sector workers whose jobs are offshored and it is significantly under-funded. The $700 million in Medicare cuts made to pay for it may be partially addressed, assuming the Senate goes along, but even if that is fixed, another $250 million in cuts to a Medicare kidney dialysis program and a whole lot of political liability are still in there. The good news is that Republican leadership and the White House face a heavy lift to win on TAA next week, as we destroyed the measure in a 126 – 302 vote on Friday. That said, the President wants this BAD. 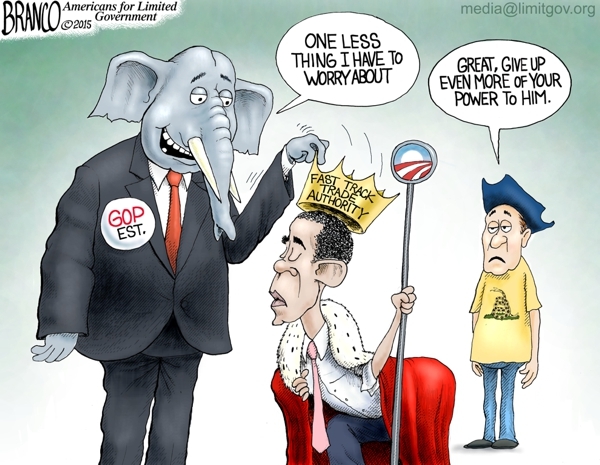 Speaker Boehner wants this BAD. We need to keep pushing so that we win that vote, and that we win whatever sorry plan Team TPP comes up with next to try to squeeze Fast Track through this month. * If you represent an organization, please make sure to call any Reps who voted against Fast Track and the TAA this weekend and early on Monday to thank them and urge them to do so again. * If you haven’t yet, please send a personal email now thanking or spanking your representative for their votes on Friday. * Take a moment to look up your your Reps Twitter and Facebook accounts, and spend a couple moments on social media today urging them to vote against Fast Track and the cynical TAA ploy next week. Be ready for any rapid-response action requests that come early next week. Again, we could see new voting as soon as Monday. Together, we’re going to keeping riding this wave of success. Thank you again for everything you’ve done to get us this far. This week, the U.S. House is scheduled to vote on a repeal of the federal estate tax. A tax which only effects the top 0.2 percent of households and provides a meaningful check on the growing concentration of wealth in the United States. Repeal of the estate tax would result in a $3 million average tax cut to the wealthiest 0.2 percent of households and a $269 billion tax revenue shortfall for the federal government over 10 years. To put these figures in perspective, this $269 billion could help pay for the $164 billion federal highway and mass transit trust funds shortfall, President Obama’s $75 billion proposal to provide publicly-funded preschool to low- and moderate-income children, and the president’s $60 billion proposal to provide free community college to nine million students. In one form or another the estate tax has been around since 1797 and in its current form in our laws since 1916. It was most recently amended in 2001 as part of the Bush tax cuts and again in 2012, lowering the top tax rate from 55% to 40% and raising the estate tax exemption from $675,000 to $5.4 million, greatly narrowing the scope of the tax. At a time when Congress is slashing the federal budget to the tune of $5 trillion and making devastating cuts to programs such as food stamps, education, Medicare and Medicaid, college aid, job training, medical research and rebuilding our crumbling roads and bridges, Congress should be looking for ways to generate new income, not cut existing taxable income for the very wealthy. It should also be pointed out that the principal recipients of government handouts in one form or another are the 1 percent. They steal this money via bribery in one form or another via government subsidies, military spending, forced federal public school testing, keeping the minimum wage artificially low, food stamps for employees of corporations which subsidizes their profits that go to the rich, and many of these corporations are enjoying record profits year after year. Let congress know you that you are opposed to another welfare program for the rich. Join the Economic Policy Institute by clicking the link below and signing the petition. What’s the Difference Between the Democratic and Repubican Parties? The difference is so obvious! 1. Roughly 100 percent of Republicans in the US House of Representatives and the US Senate are stoutly and publicly against all of the above. Think Orrin Hatch and Mitch McConnell. 2. On the other hand, only 10/15’s of the Democrats in the US House of Representatives and the US Senate are privately opposed to all eight points above, as well as is the president in the white house. 3. 4/15’s of the democrats publicly and privately support one or more of the points, but not all of them. 4. 1/15th of the democrats publicly and privately support all eight points. 5. 100 percent of the democrats in the US House of Representatives and the US Senate, as well as the president in the white house, publicly support Elizabeth Warren’s eight point plan.